This is a lovely place for walking the dog and admiring the view. In fact lots of us do just that. There is a particular nice circular route through the nature reserve and along the sea wall used by hundreds of people and their dogs. Please remember though that Portbury Wharf nature reserve and the salt marsh is also a vital area for wildlife. The salt marsh, although not part of the nature reserve has mud, rich in food, and nutritious plants, not available on the reserve. So mammals and birds flock here. So how can we all rub along together? Maybe, it is as simple as understanding the needs of our wildlife, so we know when it is important to keep a wide berth. in the winter and when the ground is frozen and the salt marsh is the main source of nutritious food. Getting enough food could be the difference between life and death for the wildlife. So not disturbing the flocks of resting and feeding birds is a good plan. in late winter, there may be heavily pregnant roe deer feeding on the salt marsh. in early summer young deer fawns maybe left hidden on the salt marsh. if large birds, swans in particular , are on the salt marsh. They are too big and clumsy to take off quickly so they are vulnerable to attack from foxes and dogs. where the water voles live . The rhynes are home to water voles and swimming dogs could stop them feeding. NB they need to eat at least 90% of their own body weight each day, more if they are pregnant. in the Sanctuary, fields and ponds – these are wildlife only areas, so a no go area for dogs and people. Individually we may not make much of a difference, after all what harm can one person and one dog cause? Maybe not much, but multiply that by hundreds of people and dogs . . . 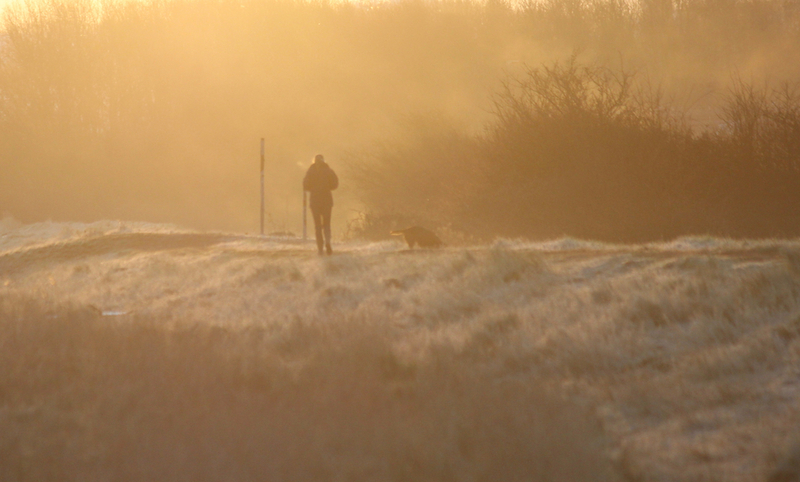 So we hope you enjoy walking the dog, enjoying the view and looking out for our wildlife.